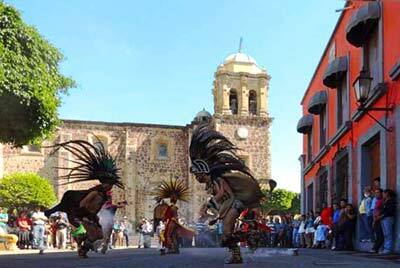 Throughout Mexico there are more than 80 Magic Towns that feature a whole host of charming tourist attractions. When we talk about the "Magic Towns" in Mexico, we are not talking about towns inhabited by magical beings, or strange places where weird paranormal things happen. These fascinating Mexican towns and cities feature a different kind of magic, in a much more powerful and lasting form. It's the type that emanates from citizens who strive to keep their traditional celebrations and customs alive that shows communities committed to the conservation of the historic monuments and the architectural charm of the places they call home. These are the foundations that these "Pueblo Magicos" are built upon, fighting to preserve traditional cuisines and crafts, as well as the colorful buildings and the natural beauty that surrounds them. As you can imagine, the beauty and historic value of the "Pueblos Magicos" precede even the program promoted by the Mexican Tourist Board that gave them the title. This is why the Tourist Promotion Council states: "More than a revival, this is recognition of those who inhabit these beautiful places in Mexico and who know how to conserve their rich culture and history for everybody." For a town or city to be recognized as a "Pueblo Magico", it must pass through a rigorous selection process conducted by the state and federal tourist boards, while also complying with certain features. These characteristics include having a unique tourist attraction, different to other communities in the area and the country. To apply for the process, the community must also take great care of the architectural aspects of the town or city. In addition to this, it must have emblematic buildings, significant artisanal production, and traditional cuisine, as well as other traditions and celebrations typical of the community; features that form its identity. Among the ever-growing list of "Pueblos Magicos" in Mexico you'll find Huasca de Ocampo and Real del Monte, both close to the state capital Pachuca in Hidalgo, with a mining past and houses built in white with red tile roofs. There are lots of attractions near these towns, which include haciendas and temples from the 16th to 18th centuries, along with natural monuments, such as the famous "Basaltic Prisms". The state of Michoacan has three "Pueblos Magicos", one of which is Patzcuaro, a beautiful town founded even before the arrival of the Spanish Conquistadores. This charming community is at its most beautiful during the Day of the Dead celebrations on November 1st and 2nd. This state is also home to Tlalpujahua de Rayon and Cuitzeo, both towns with pre-Hispanic origins featuring countless buildings from the 16th, 17th, and 18th centuries. They also offer an impressive array of celebrations throughout the year, ranging from solemn processions to colorful dances, folkloric music and fireworks. When you visit here you can also enjoy delicious snacks typical of Michoacan cuisine, with some of the highlights being "corundas", "uchepos", "charales", and "pulque". The state of Veracruz also has two peaceful, traditional towns registered under the program: Coatepec and Papantla, which have produced coffee and vanilla respectively for centuries. These are just some of the fantastic natural aromas that accompany travelers during their visit to these "Pueblos Magicos", as well as the lush greenery typical of the region. Here you can admire the legendary "Voladores de Papantla" (Flyers of Papantla) circle the pole as they descend from a great height during a memorable ritual connected to the agricultural activity in the region. There's nothing like an aromatic cup of coffee to start the day in Coatepec, which is also famous for the outdoor activities available nearby. Bacalar is a relaxing fishing village in Quintana Roo with a history full of exciting stories about defending against countless attacks from the real "Pirates of the Caribbean". It also offers numerous natural attractions, including an enormous cenote with crystal-clear water, and the main star, the Bacalar Lagoon, also known locally as The Lagoon of Seven Colors, a truly breathtaking place of rare beauty. Comala is a little town in Colima that has recently been declared a "Pueblo Magico", featuring narrow alleys, houses white as snow, and vibrant red roofs. The main holiday here is December 12th, the day of the Virgin of Guadalupe. The craft in this town is carpentry, mainly mahogany, creating exquisite furnishings and ornaments. Another two fascinating "Pueblos Magicos" are located on different sides of Mexico: Izamal in Yucatan, and Todos Santos in Baja California Sur, close to La Paz. In these two spots you can appreciate two completely different aspects of the colonial era. On one hand, Todos Santos is home to a major Jesuit mission that has now become one of the main attractions, while Izamal was, at its peak, one of the most important cities of the great Mayan civilization. The mixing of indigenous and Spanish cultures has created a marvelous blend of architecture, culinary, and handicrafts, which can today be enjoyed during a peaceful walk through the cobbled streets. There are many more stories behind each and every one of the "Pueblos Magicos" in Mexico, of which there are now more than 80. The only question that remains is where to start your journey!